Distraction? • Existing laws struggle to keep pace on tech superhighway. San Diego • A California woman believed to be the first person cited for wearing Google Glass while driving won her case, but legal experts say it marks only the beginning of what they predict will be numerous court battles fought in the gap between today&apos;s laws and fast-arriving technology. Cecilia Abadie&apos;s was found not guilty Thursday after being cited for wearing the computer-in-eyeglass device while driving because San Diego County Traffic Court Commissioner John Blair said there was no proof beyond a reasonable doubt that the device was operating while she was driving. But Blair stopped short of ruling that it is legal to drive while Google Glass is activated. Abadie was cited under a code banning operation of a video or TV screen at the front of a vehicle that is moving. Blair said the code&apos;s language is broad enough that it could also apply to Google Glass if there were evidence the device was activated while the motorist was driving. 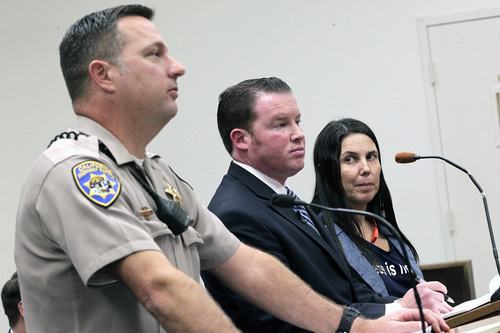 But Abadie, who wore the device around her neck during her trial, insisted afterward that the screen is above her line of vision, its functions can be activated with her voice or a wink, and it is not a distraction even when activated. "I&apos;m recording a video of all this," she told reporters outside the courthouse as she answered questions without skipping a beat. "Do you feel like I&apos;m not paying attention to you?" Vivek Wadhwa, a fellow at Stanford Law School, said the lower court ruling does not set a legal precedent but marks the start of what he expects will be a number of similar challenges. "The fun is just starting," he said. From driverless cars to wearable devices that can enhance human functions, Wadhwa said, there are a host of legal questions to be answered. For example, when a Google-operated car is on the road and hits someone, who is responsible  the passenger, car manufacturer or software developer? Abadie, a software developer, is among thousands of "explorers" who have been selected to try out Google Glass before the technology becomes widely available to the public later this year. The device features a thumbnail-size transparent display above the right eye. Her attorney, William Concidine, said anything can be a distraction, such as when drivers turn the radio dials to change stations. He wants lawmakers to rule that Google Glass can be used safely while someone drives, so codes like the one used to cite his client are not left up to the interpretation of individual judges. "I believe there is an information gap," he said. Legislators in at least three states  Delaware, New Jersey and West Virginia  have introduced bills that would ban driving with Google Glass. 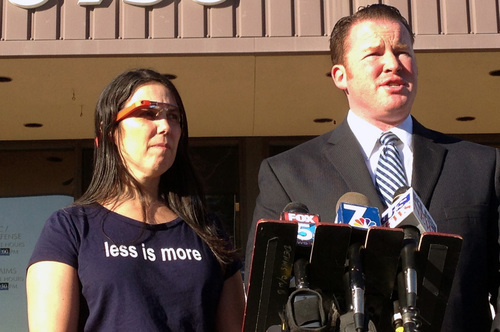 After the ruling, Google said it has warned early Glass adopters to exercise caution. "Glass is built to connect you more with the world around you, not distract you from it," Google said in a statement. "Explorers should always use Glass responsibly and put their safety and the safety of others first."